The Bronx River Art Center is pleased to announce the upcoming presentation of BRONX:AFRICA FILM CONNECTIONS, an evening of short films by Bronx Filmmakers. 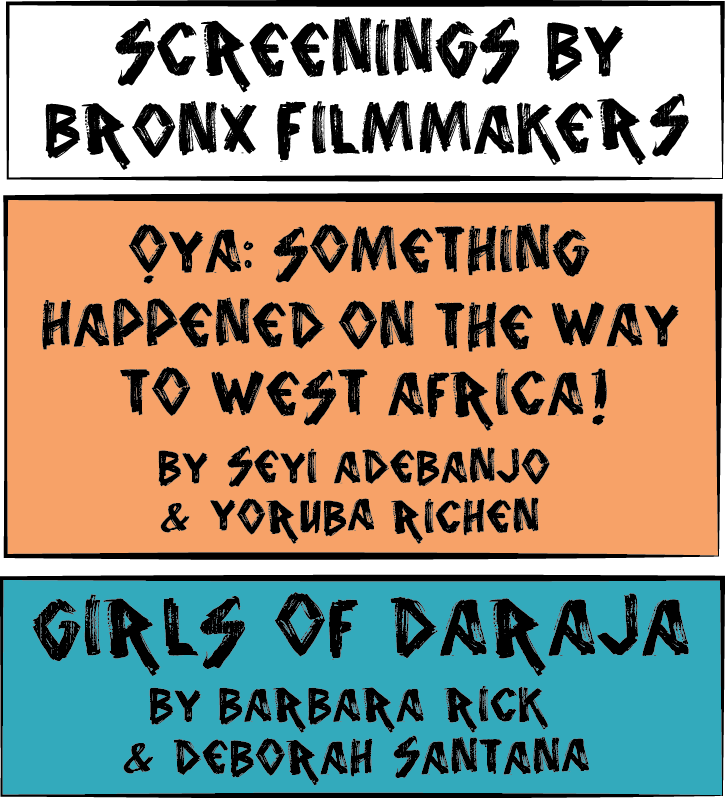 We will be screening three short films, Oya: Something Happened On The Way To West Africa! by Seyi Adebanjo, a Bronx Filmmaker from Nigeria, and the first and third films of a three-part series, The Girls of Daraja, by Bronx Filmmaker Barbara Rick. This event will take place at The Bronx Music Heritage Center on Friday, May 27th, at 7:00 PM. Oya: Something Happened On The Way To West Africa! illuminates the lives of Òrìsà Oya (Warrior Goddess), Chief Moloran Ìyá Olo’ya and Seyi Adebanjo while interweaving Yorùbá mythology, poetry, performance, and expert interviews. The documentary is lyrical, interwoven with cultural nuances, ritual, interviews, chanting and narration. The Girls of Daraja is a series of three short films by Emmy Award-winning filmmaker Barbara Rick and Executive Producer Deborah Santana about the Daraja Academy, a free boarding school in Kenya for exceptional girls who need financial aid to complete their secondary education. The first film, GIRLS OF DARAJA, introduces the school and documents the arrival of an incoming freshman class full of shy but determined young girls. The second, SCHOOL OF MY DREAMS, shows the first graduating class of Daraja Academy getting ready to take their final exams and go out and change the world. In the third and latest work in the collection, DARAJA GIRLS: Powerful Beyond Measure, two Daraja students and their principal journey to the U.S. for the first time for a historic cultural exchange with high schools in Northern California, sharing powerful stories about the impact of girls' education worldwide. The moving series portraits have won numerous industry prizes including Best Documentary, Audience Favorite, Best Director, Best Cinematography and other honors, and have been featured nationwide at film festivals and special event screenings including the Smithsonian. Still from Oya: Something Happened On The Way To West Africa! Courtesy of Barbara Rick, Out of The Blue Films, Inc.